Localytics is a cloud-based analytics and marketing platform that provides real-time insights into user behaviour on web and mobile applications. Beyond providing insights, Localytics further assists marketers in connecting, engaging and nurturing application users. Localytics’ retention feature provides cohort-based retention analysis to distinguish and foster loyal clients. In addition, the feature generates granular analysis that pin-points reasons for business problems such as user drop-off, low conversion rate, and reduced client retention. Localytics’ email marketing feature shares customized emails with prospects triggered by business rules set by marketing executives. The platform’s attribution feature provides return on investment (ROI) analysis of marketing campaigns and sponsored advertisement on Facebook and Twitter, enabling marketers to understand and compare the value of each platform for their business or brand. Great tool to log and analyze metrics for web and mobile features. A lot of flexibility defining user profiles and attributes that allow us to automatically contact users directly from their service, according to how they're using different features and how the defined attributes and profiles are being recorded. 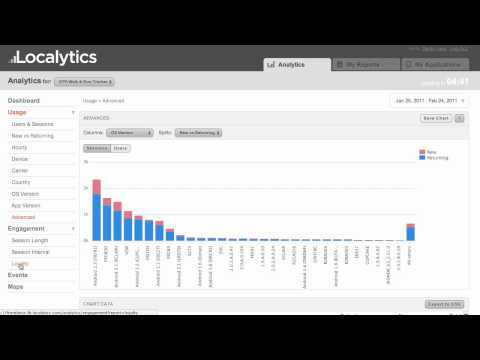 It's stunningly simple to generate excellent usage reports with a few well placed tags. It has allowed us to really understand application usage and make real decisions based on these reports. My only grief is that time-based measurements (e.g. how long does X take) only show min, max, and mean options for event splitting. Adding a 'median' option would solve all my problems. As I've been using it regularly for close to a year, I've been able to automate a lot of reporting and campaign optimization processes that have helped see into our data at a more granular level.I really enjoy running a/b tests and having the ability to optimize testing variables for the duration of tests...I found this capability to be one of the stronger features in the program. I really enjoy running a/b tests and having the ability to optimize testing variables for the duration of tests...I found this capability to be one of the stronger features in the program. It is not always straightforward in being able to view cumulative results of mobile campaigns in one area within the main dashboard...gathering this information can be time consuming and manual. Localytics is a fantastic tool for everything ranging from acquisition tracking to engagement cohorts to retention and reactivation. Not only does it function as a great dashboard for all cross-platform user data but also allows for actions on the outcome of this data in the form of campaigns of different kinds (App Push, Email, etc.). The sales and the customer champion teams are extremely helpful and are always fully aware of their product to the most granular level. More importantly, they understand specific use cases with ease and come back with novel solutions or alternatives for the same problem. Great product. Localytics enables executives to connect, engage and nurture users across the lifecycle via various marketing channels such as Facebook, Twitter, push messages, and emails. The platform is officially accepted by the Facebook Marketing Partner and Twitter Mobile Measurement Partner programs. Localytics’ deep analytics capabilities point-out reasons for user drop-off, derive customer lifetime revenue (LTV), and provides customer segmentation based on demographics and device. Executives can test, identify, and compare performance of different web and mobile pages with the help of A/B testing. The platform can also be integrated with third party software and platforms such as Marketo, Optimizely, and Tune, etc. for data export & import along with enhancing platform’s capabilities. Below are some frequently asked questions for Localytics. Q. What type of pricing plans does Localytics offer? Q. Who are the typical users of Localytics? Q. What languages does Localytics support? Q. Does Localytics support mobile devices? Q. Does Localytics offer an API? Yes, Localytics has an API available for use. Q. What other apps does Localytics integrate with? Q. What level of support does Localytics offer? Q. Which apps is Localytics compared to most often?